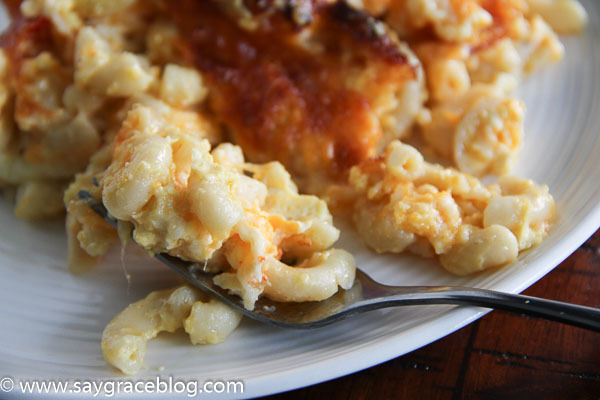 My most requested recipe for south side mac and cheese! Happy National Mac and Cheese Day!! I was so excited to hear that this special day of the year was coming up. It would mark the day that I would share my most requested recipe with the world! It’s my momma’s original recipe that I’ve tweaked and tweaked over the years and have finally come up with what I think is the best in its Southern Style class. So now there’s Southern Style Mac and Cheese which typically uses eggs and is traditionally oven baked then there’s stove top which is usually made with a Mornay sauce and is still very tasty! I’m not partial when it comes to mac and cheese as I love ’em all, including this delicious Mac & Cheese Soup as I don’t discriminate. However, if I tried to serve a stove top style mac and cheese to my family for Thanksgiving or Christmas, I would promptly be put out to the curb. 🙂 It certainly wouldn’t fly with them! There’s something about that custard-like texture and that cheesy golden brown crust that forms over the top of the dish that makes it a hit for the family. I’m sure it’ll be a hit with yours too! Let’s start by bringing a large pot of water to a boil. Make sure to add enough kosher salt to the water. You’re shooting for the saltiness of the ocean. This is virtually your only opportunity to flavor the pasta. Once the water comes to a boil, pour in 1 lb. of macaroni (sometimes I use medium shells, but today is macaroni and cheese day, not shells and cheese 🙂 ). Be sure to stir occasionally so that the pasta doesn’t stick to the bottom of the pot. While your pasta is boiling, spray a 10X13 casserole dish with cooking spray. Shred and mix 2 cups of shredded Colby Jack cheese (8 oz. block), 2 cups of Extra Sharp Cheddar (8oz. block) and 2 cups of Pepper Jack with Cream Cheese together. I usually shred all of the cheeses myself but I discovered this pre-shredded pepper jack with cream cheese and fell in love with it! Place a small amount of the mixed shredded cheese into the bottom of the greased casserole dish and spread to cover. After the pasta has been boiled for 7 minutes, taste one to ensure that it’s al dente (to the bite) and remove from the heat and drain. Pour the pasta in a large mixing bowl and mix well with 1 can of cheddar cheese soup and 1 cup of full fat sour cream. Spread half of the macaroni mixture over the scant layer of mixed cheese. Sprinkle a little kosher salt, black pepper, cayenne pepper (I like it spicy) and 6 pats of butter of the macaroni. Careful with the salt as the pasta is pretty much seasoned from the boiling water. Repeat with half of the remaining cheese, the remaining pasta mixture, salt, black pepper, cayenne pepper and 6 more pats of butter. Place the remaining amount of shredded cheese over the top. Now crack 3 eggs (chalaza removed :)) and beat until mixed well. Then pour the eggs into 2 cups of half and half and mix well. Once mixed, pour the milk mixture over the entire casserole and poke with a knife to make sure that it spreads through the entire dish. 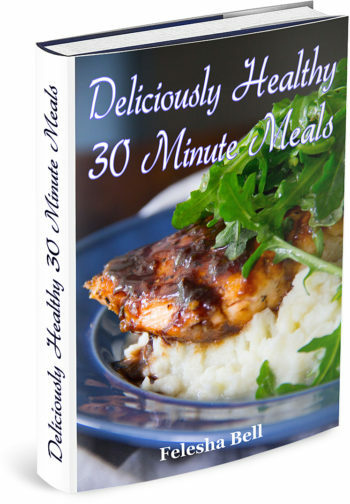 Now place in a 350 degree oven for 1 hour or until browned. Check it at 50 minutes just in case. Every oven varies from the next. It should be nice and bubbly brown with crusty edges! Take it to your next potluck and make a new friend or two! 🙂 Say Grace and enjoy! A STEP BY STEP VIDEO TUTORIAL!! Bring a large pot of water to a boil, adding enough kosher salt to the water to taste. Once the water comes to a boil, pour in macaroni, stirring occasionally to ensure that the pasta doesn't stick to the bottom of the pot. While your pasta is boiling, spray a 10X13 casserole dish with cooking spray. Mix cheeses together and place a small scant amount into the bottom of the greased casserole dish and spread to cover. After the pasta has been boiled for 7 minutes, taste one to ensure that it's al dente (to the bite) and remove from the heat and drain. Pour the pasta in a large mixing bowl and mix well with cheddar cheese soup and sour cream. Spread half of the macaroni mixture over the scant layer of mixed cheese. Sprinkle a little kosher salt, pepper, cayenne pepper and 6 pats of butter of the macaroni. Repeat with half of the remaining cheese, the remaining pasta mixture, salt, pepper, cayenne pepper and 6 more pats of butter. Place the remaining amount of shredded cheese over the top. Crack eggs and beat until mixed well and pour them into half and half and mix well. Once mixed, pour the milk mixture over the entire casserole and poke with a knife to make sure that it spreads through the entire dish. Place in a 350 degree oven for 1 hour or until browned. Check it at 50 minutes just in case. It should be nice and bubbly brown! Say Grace and enjoy! This looks so delicious!! That crust on top looks perfect!! Thanks Jessica! 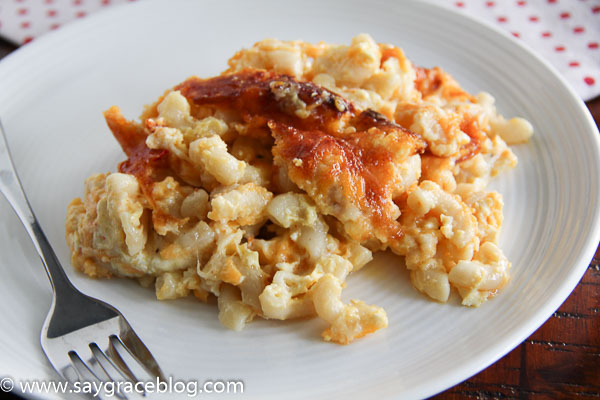 Do you prefer stovetop mac and cheese made with a bechamel or baked? Can I substitute something for the cheese soup? My daughter is gluten free. Looks amazing and would love to try with gluten free pasta for her. Thanks!! Hi Stephanie! Go ahead and leave it out but I would add an extra 1/2 cup of sour cream so about 12 oz. total. Be sure to let me know what you think! Thanks for stopping by! Can the pepper jack cheese be substituted by something else? My boys aren’t a fan of spicy cheese. Great recipe for lent. Hi Danielle! We don’t find the pepper jack to be really spicy but my mom always used colby, colby-jack and extra sharp cheddar which is the original recipe. Let me know what you think! I made this for dinner tonight. I have 2 picky eaters and they can back for seconds and thirds! Thanks,for such a great dish! This is absolutely amazing. With all the cheeses and other ingredients. What is Chalaza (eggs) removed? I was a little confused with that. I plan to make this Sunday for my Sunday diner. My sons love Mac and Cheese. One loves any even stove top, but other two will not eat any but oven baked. I added your site to my favorites and plan to check for other amazing recipes. Thanks. Hi George! Kraft makes a Philadelphia (Cream Cheese) Pepper Jack Shredded Cheese. If you can’t find it, plain pepper jack works just fine. Let me know what you think!! I didn’t have any macaroni and cheese over the holidays so I was dying to make some. I also made your “Momma’s Wild Salmon Croquettes.” Both dishes were a hit! Thanks for sharing these delicious recipes! Hey, that was supposed to be 5 stars! 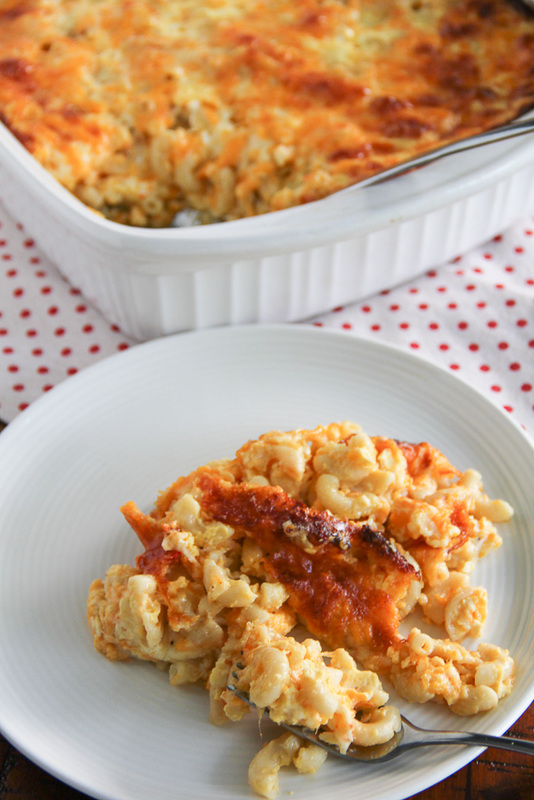 I am excited to try this recipe out as well as your hot water cornbread for my dinner tonight! Curious, can heavy cream or evaporated milk be used in place of half and half? I have both of those on hand, and trying to see if I can make use before I go buy the half and half. Thanks! Hi Cassandra! Yes. The evap milk will work just fine. My mom taught me to make it with evap. I changed to have half and half to increase creaminess. The whipping cream took forever to set when I experimented. I would suggest evap. Let me know how it turns out for you!! Because I make a pretty good, home made, Mac & Cheese myself, I generally don’t consider saving a recipe made by other people. But, after watching the video of you making this awesome version, I couldn’t help myself; it looks that delicious!!! Thanks for another great recipe.